I tossed around ideas. I wasn't sure what to do. All I knew is that I wanted to challenge myself to do at least one mini this year! 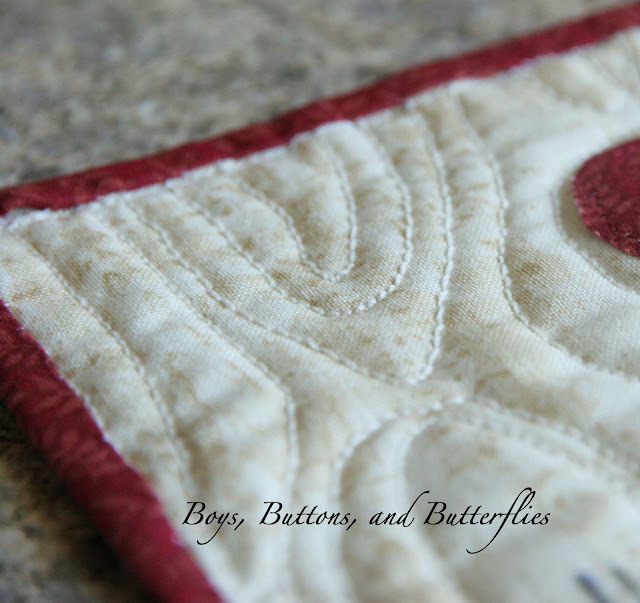 I have only have done two quilts that are mini ever in my quilting life. Not to include the quilted throw pillows. Warning: I have never made a "Mug Rug"! 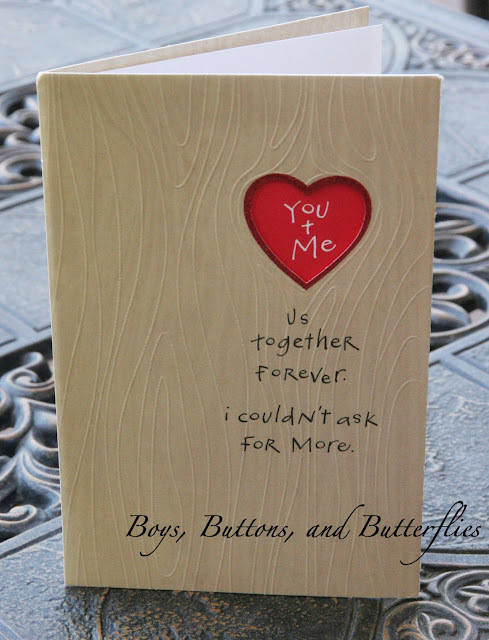 When I bought this card for my husband for Valentine's, I almost didn't want to sign it and put into the envelope...it was too cute! 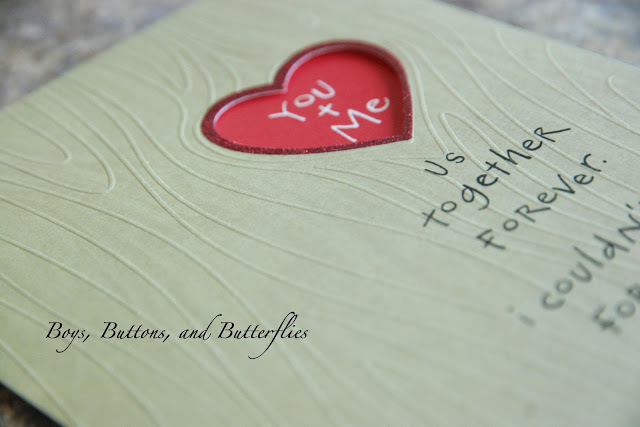 I loved the heart, the idea of a tree trunk, and the raised embossing on the card. I confiscated it before he knew it! 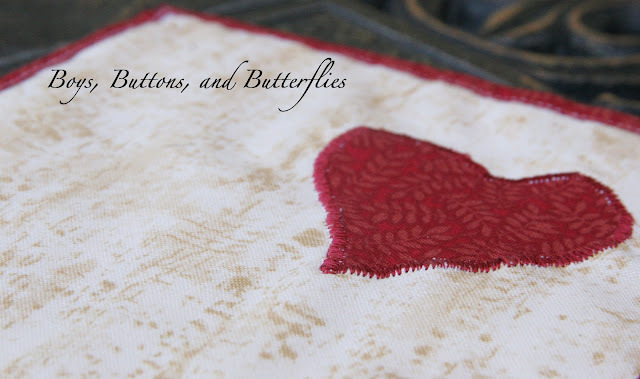 For my mug rug, I appliqued a heart on some beige fabric. 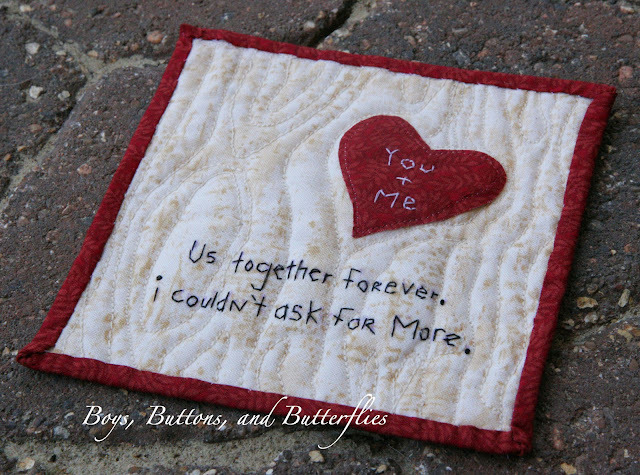 Embroidered "You + Me" in white. Embroidered the quote in black with a few French Knots. Took my mini to the sewing machine and used a REALLY heavy weight polyester thread to get the raised effect. 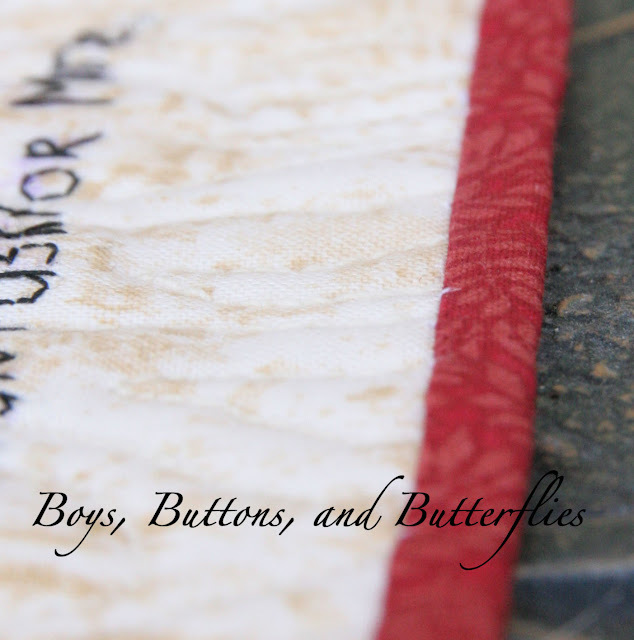 A teeny tiny binding. Only 1/4 of an inch wide on both sides. And for the backing, I used one of my earlier attempts at using a zig zag for the heart that I just wasn't happy with! I decided to cover the other backing because the heavy weight thread was obnoxious on the back. And it gave it a bit more thickness! I hope Mr. Boss likes it. 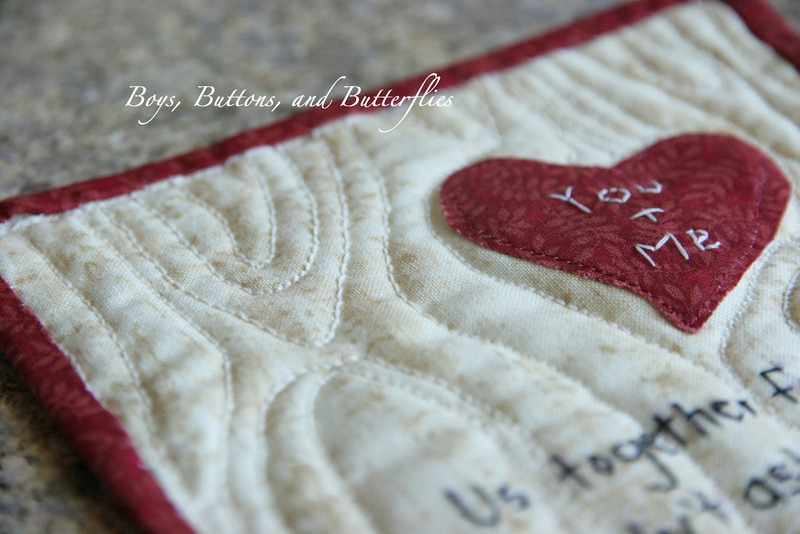 Because I am keeping the card in my studio and he is getting the mug rug for his desk at work. because, frankly, I don't think I was very good at the 5 x 5 inch version! Check out the other entries at Ellison Lane Quilts. I am not even going to pretend that I am actually a competitor. I am not even sure it is considered "modern". I just enjoyed the challenge! Heidi, that's so cute! I never set out to make minis, but I so often have small class projects leftover, or technique test projects left over, or need to make a small quick gift for someone that I wind up making quite a few. Maybe I should make some more deliberately! Yours is just lovely.